Opioids include drugs like codeine, morphine, fentanyl, heroin, and methadone. Opioids can also be used as a painkiller and are prescribed by a doctor. Just because it's a prescription drug does not make it safe. Anyone who uses prescription or non-prescription drugs is at risk of overdose. Fentanyl is an opioid that is much more toxic than most other opioids. This makes the risk of overdose much higher. as a powder and mixed with other drugs (like heroin, cocaine or crack). as pills and sold as things like Oxys, percs or eighties... and they look like the real thing! as other pills like speed and ecstasy/MDMA. Visit StopOverdoseOttawa.ca for more information on Fentanyl and Carfentanil. Counterfeit pills can look identical to prescription opioids. Getting drugs from a friend, ordering online, or from a drug dealer is very risky and can be life-threatening. There is no way to know what is actually in the drug or how toxic it may be. Drugs should only be purchased from a pharmacy or medical professional. An overdose happens when a person uses too much of a drug, or a combination of drugs, than what the body can handle. In an opioid overdose the brain is not able to control basic life functions, which can be fatal. 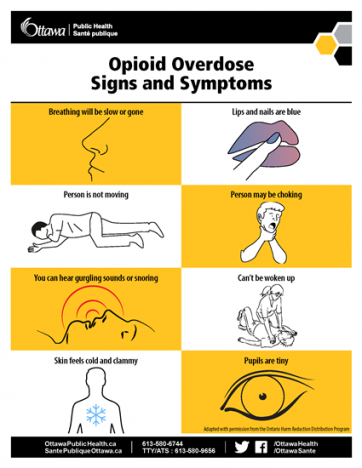 Visit StopOverdoseOttawa.ca for more information on opioid overdoses and signs and symptoms. Visit StopOverdoseOttawa.ca for more information on how to respond to an overdose, Naloxone, and Take Home Naloxone Kits. Visit StopOverdoseOttawa.ca for a list of local resources.